The first locust control campaign in response to the Madagascar locust plague is proceeding at a fast pace. Between 1 and 20 March 2014, the treated area increased by more than 167 000 hectares. FAO has the necessary human and logistical resources to ensure the treatment of 1.5 million hectares. The three-year Programme in response to the locust plague (2013-2016), implemented by FAO in collaboration with the Government of Madagascar, in particular the National Coordination Unit, the National Anti-Locust Centre and the Plant Protection Directorate, is right on track. Thanks to the arrival of a spraying fixed-wing aircraft at the beginning of March 2014, there has been a significant increase of the treated areas. As of 20 March 2014, over 400 000 hectares were treated, including more than 167 000 hectares in the last 20 days. 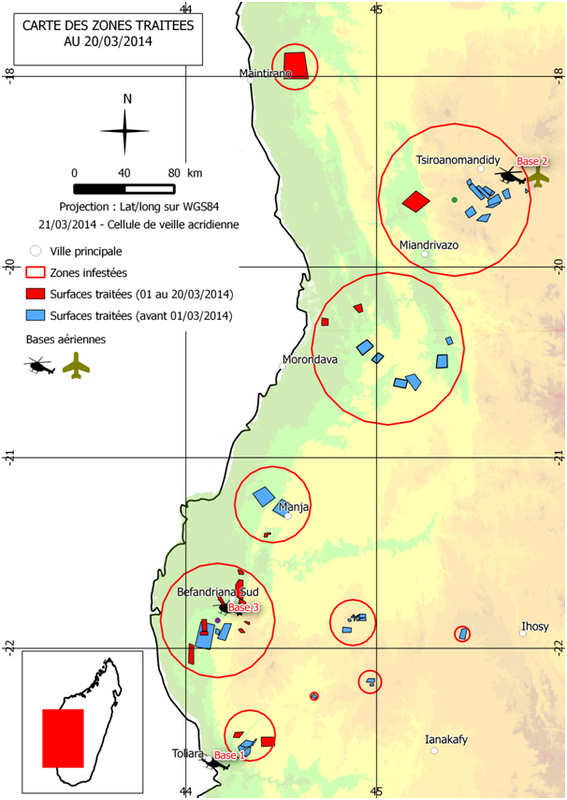 The most recently treated areas are located along the western coastal plains, near Befandriana-Sud, Belitsaka (between Maintirano and Morafenobe), Antanimieva and Ankiloaka (70 km North of Toliara), Ankiliabo and Bevoay, and Manja. The total quantities of pesticides used since the beginning of the locust control campaign amount to 189 251 litres of chlorpyrifos and 42 550 litres of teflubenzuron. The flight autonomy of the fixed-wing aircraft has boosted control operations, reaching areas normally inaccessible by helicopter. The three helicopters continue to conduct survey and control operations in their respective deployment areas. Close monitoring of locust populations ensures an overview of the locust dynamics and timely treatment of priority areas. In case treatments are necessary in sensitive areas, almost 700 kg of biopesticide, which is harmless to the environment and human health, is now available. FAO plans to acquire a total of 1 500 kg of biopesticide for the first campaign. One kg of biopesticide, which costs USD 288, can treat an area of 20 hectares. If all conditions are met, locust mortality occurs within 10 and 15 days after treatment. To ensure an adequate usage of biopesticides, an expert from Australia is currently in Madagascar to train personnel of the National Anti-Locust Centre. FAO has the necessary human and logistical resources to ensure the treatment of 1.5 million hectares, as estimated in the three-year Programme. The scale of the area to treat obviously depends on the dynamics of the locust populations. The first campaign aims at putting a halt to the current locust plague. The second campaign, from September 2014 to August 2015, will support the anticipated decline. At the end of the third campaign, Madagascar should return to a recession situation. An effective and efficient preventive control strategy should then be implemented in order to avoid any further upsurge. This is the reason why FAO provides continuous support to the National Anti-Locust Centre, allowing it to have the necessary capacities to maintain a recession situation, the only sustainable and manageable strategy at a lower financial and environmental cost. The current total funding for the three-year Programme amounts to USD 26 million. Funding has been provided by the Government of Madagascar through a Work Bank loan, as well as from other resource partners, such as Austria, Belgium, the Central Emergency Response Fund of the United Nations, the European Union, France, Italy, Norway and the United States of America. However, USD 17.7 million is still required in order to restore a recession situation. The three-year Programme in response to the locust plague contributes to safeguard the food security of the most vulnerable rural populations in Madagascar. It directly benefits 13 million people living in locust-infested areas.